Whitsunday Dive Centre is our legal, registered business name. Not everybody currently using our name can make the same claim. C'est la vie. We are celebrating 36 years in the Australian Recreational Diving Industry on the Great Barrier Reef. Our business is to provide a scuba diving liveaboard cruise that you will always remember for it's beauty and diversity or a dive course with the best diving instructor. You can rely on our expertise and experience for accurate and professional information about scuba diving on the Great Barrier Reef or Coral Sea. Please note that even though we are a fully operational diving business our Airlie Beach address is an office for our online business and not a retail store. If you want to contact us you must do so by phone or email. The new European General Data Protection Regulation (known as the ?GDPR?) goes into effect on May 25, 2018. We can assure you that Whitsunday Dive Centre is now fully compliant with GDPR. I am a Vietnam Veteran and Returned Serviceman. Back in the 1970's I was Commanding Officer of the Royal Australian Navy Clearance Diving Team based at Balmoral in Sydney and later, 2nd in command and Diving Officer of a Navy Minehunter, a specialised vessel for location and destruction of mines laid for the purpose of destroying shipping. 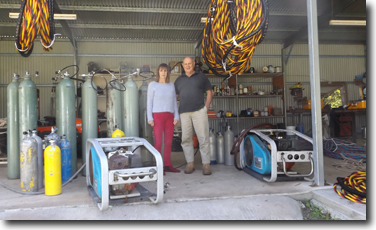 I left the Navy in 1979 and my wife Brenda and I came to the Whitsunday Islands to start our diving company, then called Shute Harbour Diving Services. Our involvement in diving has taken many forms during the last 36 years as Queensland became more populated and tourism grew. Together, we ran a commercial diving operation that established the mooring grid for the Whitsunday Islands. We salvaged sunken vessels, repaired damaged wharves and jetties, installed compressors and high pressure filling systems, established the first cylinder testing station in the region and acted as sales and service agents for all major international brands of scuba equipment. We also sold and serviced Bauer and Compair high pressure compressors. 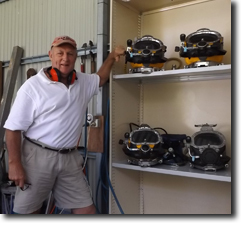 I still repair and maintain a wide range of commercial and recreational dive gear. We owned and operated dive boats on the Great Barrier Reef, taking a small number of lucky divers to pristine reefs only ever seen by a hand full of fishermen. It was then that we realised the importance of absolute professionalism when divers have travelled half way around the globe to see the world's greatest natural wonder. And that is our motivation today; to select the best recreational diving operators who give the highest priority to safety and professionalism. Through our website we endeavour to bring you the best diving experience that Cairns, The Coral Sea, The Whitsundays and The Great Barrier Reef has to offer.